The most magical time of the year is just around the corner! Christmas in Santa Fe is a wonderful season, with a variety of festive events and activities to keep you entertained. With so much to do during the holiday season, you will find it hard to pick your favorite events to attend. That’s why we are here to help you select the best seasonal activities to fit your itinerary! Here are some of our favorite events that truly make for a fantastic Christmas in Santa Fe. 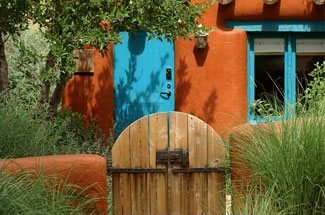 For more information on what to do near Four Kachinas, download our free Santa Fe Vacation Guide! It includes winter activities, year-round entertainment venues, and more for your holiday adventures. We can’t wait for you to enjoy the spirit of Christmas in Santa Fe! The Santa Fe Botanical Garden will be glowing this holiday season with an array of splendid lights! Enjoy the festival of lights on Thursdays, Fridays, and Saturdays through December and New Year’s for a spectacular showcase. Christmas is a much-celebrated holiday among the Catholic community of Santa Fe. Pay homage to the religious reason for the season with midnight mass. The Cathedral Basilica of St. Francis de Assisi offers this opportunity. View the breathtaking Romanesque architecture, giant Christmas tree, and historic art throughout the cathedral. An annual Christmas in Santa Fe tradition is The Nutcracker performance by the Aspen Santa Fe Ballet. See this magical performance as part of the holiday festivities. This is a great option for a romantic date night. Dinner and a ballet are a lovely combination! Christmas in Santa Fe would not be complete without the Canyon Road Christmas Eve Farolito Walk. This beautiful event features a walk down Canyon Road with candles. Small bonfires are spaced throughout the street as well, and the crowd gathers for hot cider and hot chocolate by the flames. Spontaneous Christmas carols are sung in unison throughout! Every year, hundreds of locals and visitors alike flock to the Plaza for Las Posadas. This celebration combines Christian tradition and Spanish folklore into a recreation of the birth of Christ. However, this telling involves actors who play demons trying to harass Mary and Joseph on their journey. Red face paint and makeshift horns adorn these “devils” before the procession leads to the Palace’s courtyard. Here, musicians play carols under a bandstand adorned with twinkling Christmas lights. There are so many other great activities to enjoy during the winter here in Santa Fe. Enjoy outdoor activities such as cross-country skiing and snowshoeing. Santa Fe Walkabouts is a great winter sports outfitter. Enjoy the snow while snowboarding along the Rocky Mountains, or go downhill skiing at the Santa Fe Ski Basin. There are many alpine trails in the region for snowshoeing and cross country skiing as well! Our bed and breakfast is the perfect place to spend Christmas in Santa Fe. 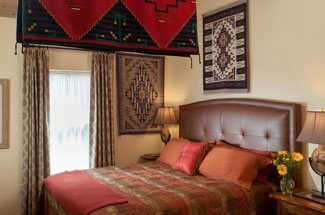 Still close enough to the city center but removed enough for some peace and quiet, Four Kachinas is the perfect holiday getaway. Start off each day with a delicious complimentary breakfast before embracing the surrounding winter wonderland and enjoying the festivities. We hope to see you for Christmas in Santa Fe!